I’ve been craving pizza the last few days. Hubby doesn’t worship at the altar of pizza like I do, so I suggest we go to the mall and eat at the food court where he can have his burger and fries and I’ll get my pizza fix. Naturally my eyes are bigger than my stomach so I order two slices and can barely finish one. Friendly pizza guy wraps up my second slice and refills my drink. Hubby and I wander the mall, me with my hands full, when suddenly I realize my purse isn’t one of the things I’m carrying. Uh oh! “I left my purse at the food court!” Hubby takes off at a jog and I waddle behind. When I reach the food court, he’s nowhere to be found. Neither is my purse. I grab the clean-up guy and ask if he saw my purse hanging from the chair. He doesn’t understand me and tries to give me a high chair. “No, my purse. It was on that chair!” He shakes his head sadly. I think he’s sad that there’s a crazy lady standing in front of him who can’t figure out how to use a high chair. I ask friendly pizza guy if there’s a lost and found and he gives me directions to the security office. I rush over there only to be told that no one has turned in a purse. Already my mind is spinning with all the things I’ll have to replace and oddly enough I’m congratulating myself on having accidentally left my phone home. At least those rotten purse thieves won’t get my new Note 4! I stand by the empty table and chair, feeling desolate. 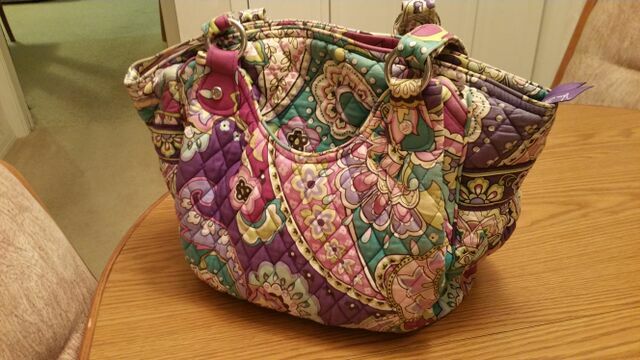 Then I spot hubby walking toward me with a smile on his face, and he doesn’t look any less manly carrying my paisley Vera Bradley purse. Heroes come in all shapes and sizes. They handle the little, every-day emergencies as well as the great big life-changing ones, not just on the pages of a novel, but in real life as well. I’ve got mine and he’s a keeper. I just hope I don’t forget him at the food court one of these days. Home | Bio | Books | Blog | Contact © 2015 LindaBleser.com. All rights reserved. Site by Glass Slipper WebDesign.